The opening depiction of the 15th century south German countryside and the strange, colorful variety of people who traveled through it, immediately plunges the reader into a time that is both mysterious and fascinating in its narration. The composition is precise, learned and detailed, with beautifully crafted prose and a meandering style that keeps the eye fixed on the page. Books of historical reference can sometimes be dry, academic missives and make for unexciting reading, except to those engaged in the study of the subject matter. The opening paragraphs of The Swerve, on the other hand, read like a literary novel, with an eye-winking approach to the argument and a penchant for the detective story motif. Poggio Bracciolini is a book hunter. He was originally a scriptor, a writer of official documents, who had risen to the position of Apostolic Secretary to a disgraced Pope John XXIII. But when the pontiff fell from grace because of his “detestable and unseemly life,” his close officials fell with him. Now Poggio must travel to remote areas to seek out ancient manuscripts as a way of making a living. He’s on his way to what may have been the Benedictine Abbey of Fulda, between the Rhône and the Vogelsberg Mountains, not knowing what he might find there. What Poggio does find, is the last surviving manuscript of an ancient Roman philosophical epic called De Rerum Natura or, “On the Nature of All Things,” by Titus Lucretius Carus, a Roman poet and philosopher who was supposedly driven mad by a love potion and wrote the epic poem in between fits of insanity. Lucretius eventually committed suicide, but his work lived on after him and influenced such Augustan luminaries as Virgil and Horace. The Swerve leaves the drama of the book hunt after the first couple of chapters and doesn’t return to it until much later. Instead, author Greenblatt introduces us to the ever intriguing worlds of medieval and classical Italy. The papal hierarchy, the Roman administrative machine and the extravagances and decadence of the Curia (what is now the Vatican), of which Poggio was a part, are detailed in what is, at times, a hugely entertaining exposé. It is interesting to note the criticisms tolerated by the Catholic Church from the humanists within its own establishment, a century before Machiavelli constructed his damning analysis of the political usage of all religious faith. The Swerve provides an expert insight into the 15th century religious psyche, which at once displays an intelligence superior to the vulgar opportunism of modern evangelism and yet exhibits a superstitious belief-system of punishment after death for wrongdoers. 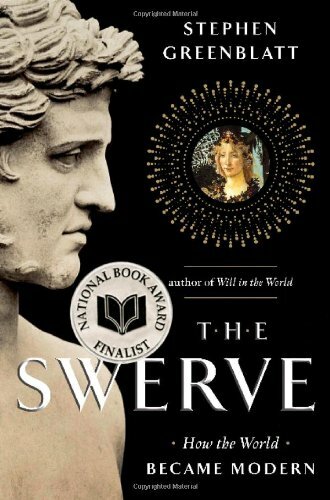 Despite being a wonderful piece of historical narrative, lively and diverse in style and content, The Swerve does at times divert itself into extensive discourses on marginal subjects such as classical architecture and the backstories of a variety of minor characters, which has the affect of slowing down the pace. The main story, which is the quest for and subsequent influence of Lucretius’ book, gets lost in an avalanche of peripheral detail for a while and, though this should be easy reading for the historian, it may very well be heavy going for the layman seeking to learn something and be entertained at the same time. Poggio himself is soul-sick at having to live in such a desolate period and fantasies about freedom—the freedom to immerse himself in the writings of another, greater and more fulfilling era of marble and elegant glassware and cameos and sculptures, that has long since passed. His downfall from Apostolic Secretary to wandering book-hunter comes at The General Council, convened in Constance, with in the region of 100,000 church luminaries and their retainers descending on the city, “nestled is the mountains between Switzerland and Germany,” to try to end the 30-year schism that was embarrassing the Catholic Church. Mr. Greenblatt’s account of this event is fascinating. The menu included blackbirds, badgers, and beavers and must have been a spectacle of amazing proportions for the time and place. It is here that Pope John XXIII is deposed and imprisoned and, thus, 170 pages into The Swerve and a mere 76 pages from the end of the narrative, the story returns to the beginning: the search for Lucretius’ De Rerum Natura. “On the Nature of All Things” is a complex piece of writing. As well as theorizing on the evolution of society, it meditates on religion, pleasure and death, as well as such modern concepts as atomic structure, the indestructibility of matter and DNA. The “swerve,” or declinatio, of Mr. Greenblatt’s title is the random deflection and collision of particles, which causes everything in the universe to come into existence, which is astounding when you consider how long ago the epic poem was written. Poggio’s intentions in releasing the work onto the world are mainly concerned with recovering the lost traces of antiquity, rather than threatening the entire religious structure of the time. Poggio eventually returns to Rome, to become a rich businessman and live to the age of 80. De Rerum Natura goes on to influence the thinking of Machiavelli, Galileo, Shakespeare, Spencer, Dunne, Thomas Jefferson, and others. Many of its revelations, written over 2,000 years ago and rediscovered by a wayfaring book hunter at the beginning of the 15th century, are now widely accepted as the facts of modern life.